When a special occasion calls for congratulations, order ice cream online from Harry & David. 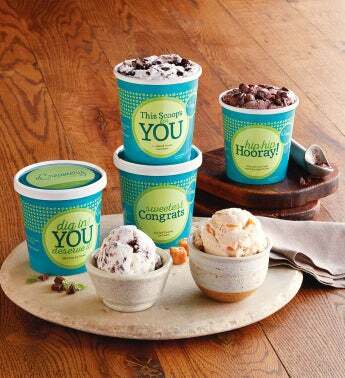 This Congratulations Ice Cream Assortment is presented with celebratory statements on each package: "Hip Hip Hooray," "This Scoop's For You," "Dig In! You Deserve It!," and "Sweetest Congratulations." Four different flavors of ice cream, including chocolate chocolate chunk and sea salt caramel, make this the perfect way to offer your praise.